The Users page is where you will add individuals who should have login access to Broker Brain. You will also identify the groups they belong in, and other key information. Once a user is added, they cannot be deleted. They can, however, be denied access by choosing the Revoke Privileges option. 3. Enter the user's First Name, Last Name, and private Email address in the appropriate fields. 4. Assign a Username and an Initial Password. Note: It is advisable that the user change the password that they are assigned when logging in for the first time. See My Account for more information on how to do this. Super User - If you were the individual who signed up for your Broker Brain account, you will see a Super User field. Super Users have the ability to see all Markets while operating in the various sections of the Admin Tab, regardless of the market selected. The first user created when the account was opened is always a Super User, and is the only individual who can grant Super User privileges to another user. This cannot be changed. Note: If you designate another user as a Super User, make sure they have Admin privileges. Agent - Any user who will be assigned as an agent to a property within Broker Brain must be identified as an agent here. This will place the individual's name on the agent list for use when assigning agents to properties. If they are not listed as an agent, they will not appear on the agent list. Field Inspector - Any individual acting as a Field Inspector in Broker Brain must be identified as such here. As with agents, if an individual is not designated as a Field Inspector, they cannot be assigned as a Field Inspector to any property. Transaction Coordinator - This was added as an option for users who work in an Administrative Assistant role. Short Sale Negotiator - Any individual who will be working as an In House Negotiator on Short Sale properties must be designated as such here in order to assign them this role on those properties. Group Manager - Broker Brain has an Auto Tasking feature that will automatically assign tasks to users based on their system settings. if you prefer to have auto tasks filtered through one individual who will delegate tasks to users, designate that user as a Group Manager. Revoke Privileges - This field allows you to remove a user's privileges from the system. Note: Once this option is selected, the user will be removed from the Active User's list and will no longer appear in the system. To find the user in the system again, click the drop-down box next to Show (located at the top right of the screen, above the green Add New User bar) and select Revoked. 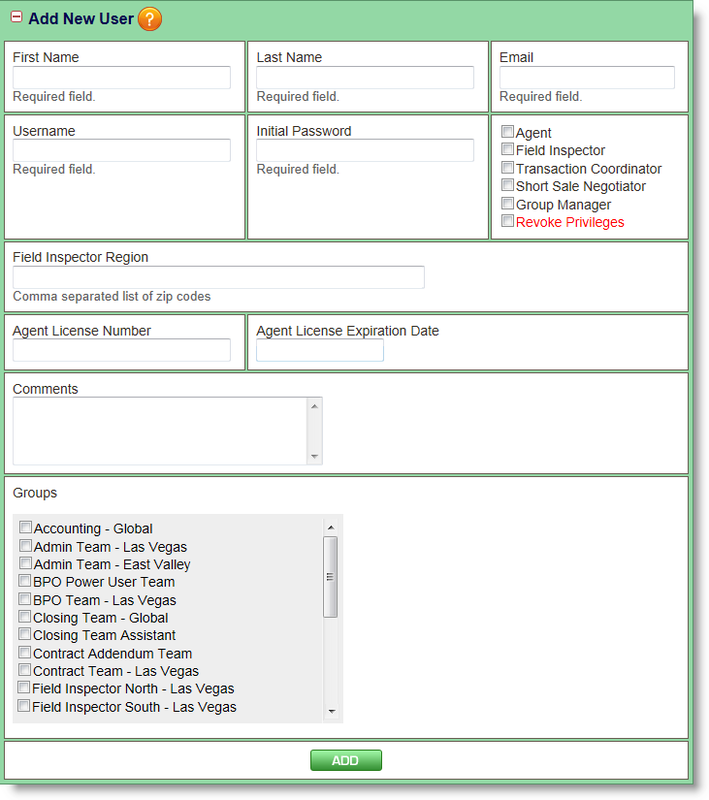 This alerts you that you need to assign Field Inspectors to those zip codes. In the reports tab, you have the ability to run an inspection report. This report will list the properties that an inspector is responsible for and group them by zip code. In order for this report to be accurate, you need to make sure that you include all of the zip codes that an inspector is responsible for in the Field Inspector Region box. 7. If the user is an agent, add the Agent License Number and Agent License Expiration Date in the fields provided. 8. Add any comments related to this user in the Comments field. 9. In the Groups section, select which Groups the user is assigned to. This will determine what capabilities they have within the system, based on what privileges you assign to that group. Users can be added to more than one group. 10. Once you have completed all of the information, click the Add button. The user's name will appear in a bar beneath the green Add New User bar, along with any other users that have been added. Updating users is essentially the same process as adding a new user. Click on the + sign next to the name of the user that you want to update and follow the steps as outlined above in Creating New Users.